Shay Brandenberger is raising her daughter in Moose Creek, Montana, on her childhood ranch, nestled against the Yellowstone River. Despite the hard work, she can't seem to keep her head above water-and now the bank is threatening to foreclose. She prays for a miracle, but the answer she receives is anything but expected. Having agreed to play the bride in the Founders' Day wedding reenactment, Shay is mortified to be greeted at the end of the aisle by none other than Travis McCoy, her high-school sweetheart-the man who left her high and dry for fame and fortune on the Texas rodeo circuit. About "The Accidental Bride (Big Sky Romance Series)"
Customer Reviews For "The Accidental Bride (Big Sky Romance Series)"
Despite being the second book in the Big sky Romance series, it was the first one I read and I was hooked from the beginning not just on this book but on the series. I immediately ordered the other 2! Denise Hunter comes up with some amazing plots for books - and This one is no different. I loved the characters and storyline and the way it ties into the 1st book of the series. Highly recommend!! I love a good romance with a bit of depth and humour, and this book ticked all those boxes. The characters are likeable (okay, I fell in love with them! ), the storyline captivating and the descriptions so vibrant I was sure I'd look out the window and find myself suddenly transported to a good old American ranch. Really enjoyed this book and immediately went searching for the rest of the series to read. This book is just like all the great historical romances where arranged marriages or marriages-of-convenience turn into the real thing over time, only it is set in modern America! Travis is a dear, patient man who is so generous and so in love it almost hurts to watch him trying so hard to win the hurt-hardened heart of Shay. I so often wanted to grab Shay and Travis and give them a good shake and then sit them down and force them to TALK to one another. So much heartache over misunderstandings and lack of communication. But eventually, love wins out and the ending is worth the agony of watching them hurt each other so much along the way. I loved the character of Miss Lucy, who may be old and scatty, but is also full of wisdom and prayer. We would all benefit from having a Miss Lucy in our lives. All in all, it was a very enjoyable book. Denise Hunter really knows how to write a romance story that will move your heart, as evident in her novel The Accidental Bride. Hunter wrote so that the story feels like reality and that the chemistry in Shay and Travis relationship feels tangible, no matter the tension. Shay Brandenberger has lived through a crazy childhood, a failed marriage, single parenthood and deep humiliation, thanks to the man who takes her breath away, Travis McCoy, her childhood sweetheart. Travis McCoy is back in Moose Creek, after many years on the rodeo circuit. It is a decision he deeply regrets as the act broke Shay's heart, causing her profound humiliation. Therefore the purpose of his return is to claim her back, although it is definitely going to test his patience. However it defiantly did not occur the way he (or Shay) expected. So when their Founders Day "marriage" re-enactment is accidentally made official, Travis seizes the day. Can Shay put aside her pride to let Travis help her, or will their accidental marriage to dissolve before it can begin? What I love most about this story is that Hunter goes straight into the plot line and keeps the story rolling. Not only that, but the intimate description of the relationship between Shay and Travis is one that will keep you hooked, giving the story a deeper meaning. However I did learn a valuable lesson that is found in Galatians 1:10- "Am I now trying to win the approval of men, or of God?" (NIV) Most females in our secular society are so caught up in trying to please society that they get so caught up in it and lose sight of reality. This is especially evident in Shay's world, for she struggles with society's perception of her, until her friend tells her that the only opinion of importance is God's. I found this a really valuable lesson for I too sometimes care too much of what others think of me. The Accidental Bride is definitely a romance novel not to be missed, due to the ability it has to stir your heart. The personalities of the characters are well crafted so Hunter translates the exact feelings she intended. 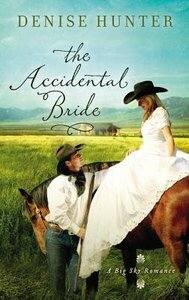 The Accidental Bride is unquestionably a novel that illustrates Hunter's ability to write deeply moving romances that grip the heart, which she is well known for.